It's a frequently asked question. 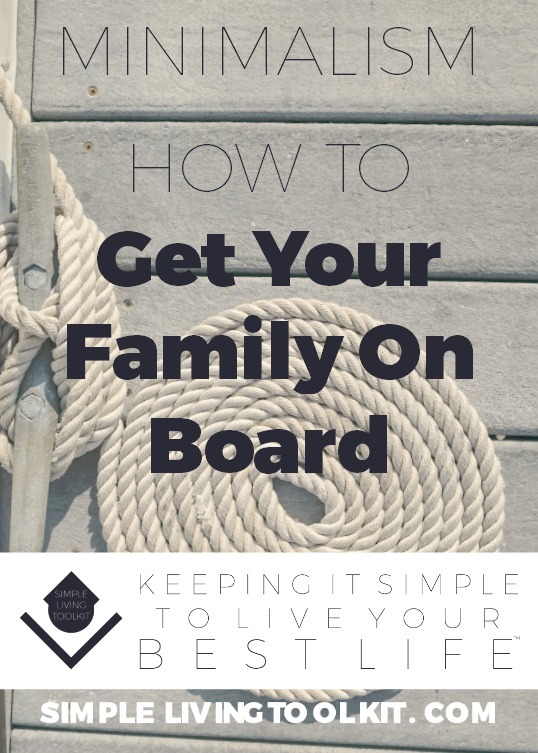 People in the minimalist living community often wonder how to deal if they are a minimalist and their family or other household members are not. If there are toddlers or teens in the house, the question is asked with an even more urgency. If you're struggling with or wondering how in the world to get the hoarders you live with aboard the decluttering train, first: I hope you know you're far from alone! Our attitudes around acquisition, consuming, clutter, and keepsakes can seem so different. And when others we live with aren't on board with our minimalism, it can cause irritation. It can be a source of misunderstanding and strife. Thankfully, it doesn't have to be like that. We can remember that instead of decluttering at all costs, we can choose to simply love -- to understand those we love, and accept who they are right now without trying to change them. The first really important point to remember when it comes to your minimalism journey is to of all start with your stuff and your spaces. Reap the benefits for yourself first. Then with the family, see it as a process. It might take some time, but slowly and surely you can win over the more clutter-prone members of your household. If your family members are messy, they are probably born collectors. Collectors are the opposite of purgers. Purgers find it easy to clear space, get rid of what isn't needed, and live in the moment. Collectors tend to take joy in curating items that remind them of times past. Also, collectors tend to be inspired by clutter, instead of stressed out by it. Among creative people, some are collectors who say they are inspired by a bit of chaos around them. Other creatives are purgers who are inspired by the equivalent of a blank canvas - a clutter free room. I myself and a born collector who had to learn how to live more minimally. To win over those "hoarders" you live with, you need to show that you understand them, their collector mindset, and their concerns. Calm any fears about important things getting thrown out. Make sure your loved ones can trust you not to get rid of things willy-nilly, without regard to their significance. Listen first, and explain later. Bring up the topic of minimalism, and see what your spouse and/or kids have to say. Listen fully, and make sure you understand all their concerns. You might start the conversation by saying something like "I'm wanting to simplify our lives by decluttering and taking a new approach to acquiring belongings. How do you feel about living with less stuff?" When listening, repeat their concerns back to them in your own language. Then ask "did I get that right or wrong?" to make sure you understand. On top of making sure you understand, this will help them really feel that you get their concerns, which is important to getting on the same page. Note: this step is best done in a one-on-one setting. Avoid "calling a family meeting" to discuss minimalism for the first time. That's because each person will feel more listened to and valued when it's just the two of you chatting about the topic. Otherwise, you risk making your family feel preached at or like they have no control and no say. Once you've listened carefully to each family member, explain why you're drawn to minimalism and what you hope to accomplish. Is it a shared dream of saving money for experiences like a trip around the world? Is it because you hope to spend less time cleaning, maintaining, and organizing, and more time having fun with your loved ones? The key is to find out what would make it fun for each family member. You know your husband and kids the best, so you know what appeals. There are so many reason to approach minimalism and different attitudes behind doing so. Some family members may be motivated by the compassionate-caring-for-the-earth side. Others by the aesthetic beauty of it. Others by the adventure they could imagine if they travel the world with what could fit into one backpack. Still others by the frustation of not being able to find their favorite things amidst the clutter. The 17-year-old might be ready to save money and save up for things they want and you can show them how minimalism helps with that. Also, there are many of people blogging about living simply with less. Each of us has a different background and different way to writing about minimalism. My book and this blog may appeal to you, but you might want to send each family member another blog, book, or video that would appeal to them more specifically. When it comes to getting kids to help out, I've found that I really have to appeal to their own sense of what is fun, and their own personality. For young kids, just doing things they see you doing might be fun. I'm not sure how much longer mopping will be fun for my kid (that's him on the right), but I'll take all the help I can get for now. Many kids like using vacuum cleaners, so you can say "when the floor of your room is clear, then you we can vacuum." That will help motivate them to clean their room. Again, all I know is it works for us for the time being. Also, if your child wants a new toy, you can say "yes" after they've decluttered a specific number of unused toys. You can say, "When you pick out four toys you don't play with anymore to donate, then we can get the new toy." Finally, like I talk about in Minimalist Living, your relationships are more important than decluttering. If minimalism is causing constant strife in your relationships, take a break. Simply love. Don't let their clutter make you give up your journey. Minimalist living will benefit your life even if you just apply it to the domains in your home and life that you have control over. It's okay to just apply it to your stuff and leave your family alone if it's not worth the fight. You've got to pick your battles. On the other hand, a clean, serene, minimalist home is, I would argue, healthier and happier for all members of the household, and it's worth the effort required to introduce this lifestyle to everyone in the family. Did this post help or inspire you? If so, please like and share it using the icons below. P.S. If you haven't signed up for the free 3-Day Decluttering Challenge yet, be sure to do so at the bottom. You'll want these motivational notes, tips, and tricks for keeping it simple right in your inbox.